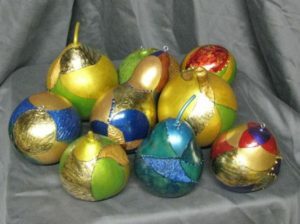 These cute little gourd ornaments are great for hanging in a window, giving as a gift, or saving for yourself as a unique tree ornament. Participants will learn to design the gourd with tape, circles, and a ruler. Simple and easy, no artistic ability needed. Then wood burning the design and then applying metallic ink dyes and other fun embellishments. The little gourds will be ready to hang with an eye hook and hanger. Lastly, they will be sprayed with polyurethane to protect them and give a finished look. Cost: $60 per person plus $10 material fee paid to instructor; Members save $6. Teaching Artist Ceil Rossi lived in Arizona for over 26 and it was during this time she discovered gourds, the magical art form of the southwest. Her earthy artwork is grown from the ground and it’s these hard shelled vessels that have perpetuated her passion for art. A unique medium for any New England artist, nature’s pottery has helped Ceil Rossi of Agawam nurture her creativity. She learned from the best, taking classes from well-known gourd artists in the Southwest. Ceil became a respected member of the gourd artist community. She then opened her own gallery, The Carefree Gourd Gallery and teaching studio in the quaint town of Carefree, Arizona. Ceil’s work can be seen in several gallery’s around Massachusetts and Connecticut and she has participated and won honors in several Fine Art shows. She also teaches in Avon, West Hartford and Windsor, Ct. and at her studio in Agawam, Ma. She is a member of many art organizations in Western Ma. and Ct. She also lectures on the history, art and culture of the gourd, From Field to Fine Art.